Echo Park has long been a haven for creative artists, and its appeal continues. Just ten minutes from downtown Los Angeles, Echo Park is convenient to employment in Hollywood, Glendale and Burbank. The downtown neighborhoods also offer a variety of restaurants, boutiques, and night clubs. Nearby Silver Lake also offers a variety of unique restaurants, galleries and nightlife options, plus ease of access to employment. It is considered the prime district for the alternative and indie rock scene in Los Angeles. In fact, Silver Lake takes the top spot on Forbes’ inaugural list of America’s Best Hipster Neighborhoods. The neighborhood boasts a booming arts scene, a multicultural blend of residents with eclectic professions, and some of the nation's most lauded farmers markets and food trucks. 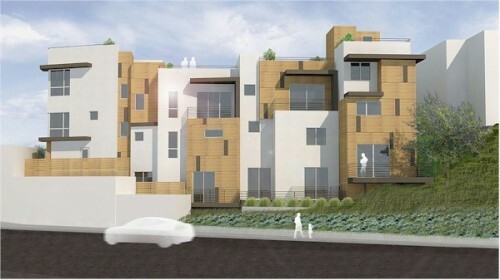 Plant Home Living's future offerings include: Gaspar, now under construction in Echo Park. 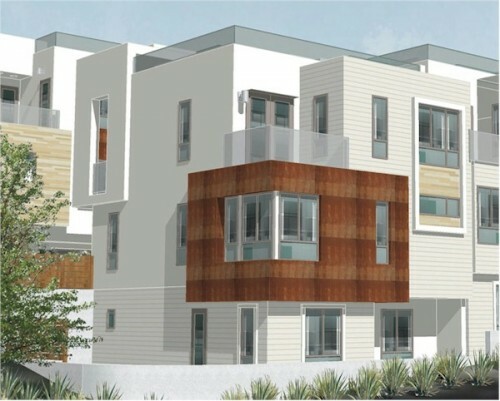 These 3-story homes, with prices starting at $763,000, are just off Sunset and offer beautiful views of downtown. Multiple decks, patios, and rooftop decks allow for seamless indoor/outdoor living. Phase 1 is completed and phase 2 is in the works. Artists rendering courtesy of Planet Home Living Personalized landscaped areas and wood siding animate the façade, while the dynamic nature of the stepping hillside and the nearby urban marketplace lend focus to the pedestrian experience. Galvez, just up the street from Gaspar, consists of two components of single-family, 3-story homes. Expect to see Galvez homes at least ready for a hard hat tour come Spring 2015 if not sooner. Nestled high on the hillside of Douglas Street in Echo Park, 7 homes at Douglas and 10 homes at Montana offer sweeping views of downtown Los Angles, plus direct access to Elysian Park and the bounty of retail shops and restaurants along Sunset Boulevard. A variety of floor plans offer up to three bedrooms and/or dual master bedrooms, in addition to two-car garages. Morra will consist of five 3-story homes on Echo Park Avenue. 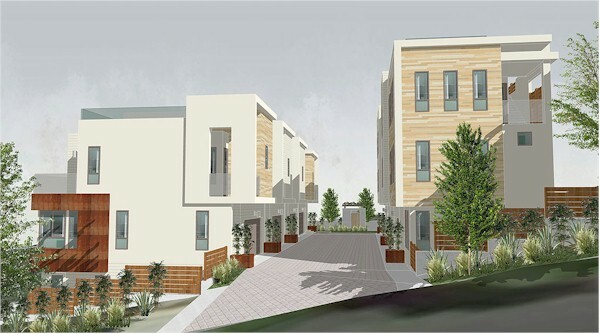 Construction of these homes, which will offer 2-car garages and roof decks, is scheduled for next year. Located in the northern part of Echo Park, Morra will offer immediate access to the Glendale and Golden State Freeways as well as nearby shopping opportunities. Manzanita, at Silver Lake offers 4 homes. Prices have yet to be determined but the homes are expected to sell in the mid $800,000's to just over $1,000,000. Until the developer releases the price list, homes are not able to be reserved. Please let me know if you are interested in any of these units and I will inform you as soon as that information becomes available. The views of The Hollywood Sign and Griffith Park Observatory begin at the first floor levels and just get better the higher up you go. If you love the hipster lifestyle, you may want to preview the offerings at all four of these new developments, but remember: Take your agent with you on the first visit. It costs you nothing and could save you thousands. When you're dealing with any new subdivision or condo development, the builder's agent is there to get the best price and terms for that builder. Your buyer's agent is along to make sure you get the best possible price and terms. Are you ready to learn more about these new developments? Call us at 213-215-4758.